What are the benefits of 3D scanning for museums and archeology? 3D printing and 3D scanning for museums and archeology are increasingly used in cultural preservation. 3D technologies provide museum curators, researchers and archeologists with new tools to capture in 3D ancient objects, artifacts or art pieces. They can then study, restore or simply archive them with much more details than traditional 2D pictures. It is even possible to 3D scan entire archeological sites to get a full 3D mapping, via drone or plane 3D scanning. 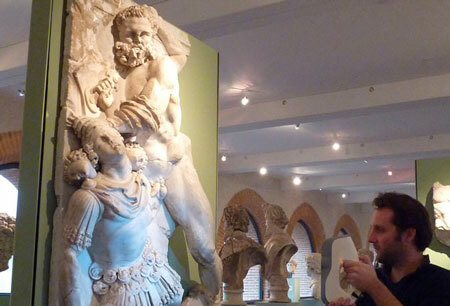 3D printing and 3D scanning can be used jointly to restore damaged sculptures. In February 2017, experts in Rome resorted to 3D printing to repair two busts from Palmyra in Syria, where many historical buildings and artifacts have been damaged and destroyed by ISIS (see more information about this here). Capturing more details. 3D scanning is more accurate than the human eye and can digitally capture a high level of details. Museums can now create their own 3D archives and store digital 3D models of their entire collections, instead of relying on mere 2D pictures. Preserving cultural heritage. Some historical sites are under danger, be that from armed conflicts, natural disasters or simply time erosion. 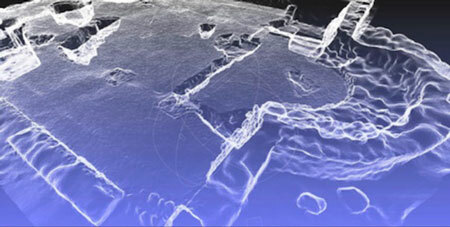 It is possible to use 3D scanning to keep accurate 3D mappings of those historical locations. Improving accessibility to museums and cultural heritage. 3D scanning opens the doors to virtual visits of museums. A person can visit an exhibition from the confort of his own home. Restoring and replicating historical artifacts. 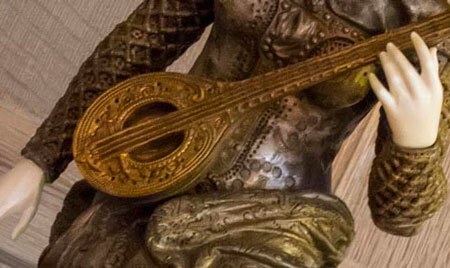 Restorative 3D scanning, when 3D capture is used in the restoration process, is increasingly used in museums worldwide. To replicate an historical object, a 3D scan has to be done first. The file generated can then be used to 3D print a replica the piece, in plastic or other materials. An ancient skull completed with 3D printing. Replicating a piece of art or historical artifact with 3D printing. Having an exact copy of an historical item will allow the museum to give more access to his collection to the public. For example, allowing students to touch and manipulate 3D printed art pieces or artifacts is a more recreational way of teaching than just showing the object. A 3D printed replica, based on a 3D scan of the original object, can also be used and manipulated by archeologists or researchers, without fear of damaging the original piece. Repairing damaged historical artifacts. If an ancient piece of art is missing a part for example, 3D printing can be used to repair it by creating a perfectly fitted new part. This approach often requires the joint use of 3D scanning and 3D modeling using a 3D design software. Restorative 3D printing is on the rise, as the technology improves and the number of printing materials available grows. PhD Researcher and 3D consultant Amelia Knowlson wrote this in-depth article on the future of 3D scanning and 3D printing in museums. According to her, the 3D technology is just starting to impact museums and historical research operations. It is sometimes complicated to restore art pieces and it can lead museum curators to remove the damaged pieces from their exhibits. 3D scanners and 3D printers are increasingly used in the restoration of works of art, including statues for which it is possible to reconstruct missing parts, such as hands (as shown on the picture). A bronze statue, whose broken hands have been replaced by 3D printed hands. A 3D model of an excavation site conducted by Archéotec. Archaeological sites are often found under construction sites and their exploration can stop or slow down the construction project. Therefore, archaeologists only have a limited time to lead searches in those excavation sites. Professional 3D scanners with a large scanning area (sometimes equipped with a GPS for higher precision) allow archaeologists to capture a full site in 3D and obtain a 3D model of the excavation site. It is thus easier to visualize locations of archaeological remains and optimize the excavation site searches. 3D models generated with a 3D scanner are often used by researchers, who can zoom-in on the 3D model of the item captured in 3D. The high level of details of the 3D scan can be very useful for research purposes, since almost invisible details can be revealed with this technology. Working on 3D models instead of original pieces also enable researches to protect light-sensitive artifacts for example. With 3D printing, it is possible to replicate an entire object or specific parts. Researchers can then work on the 3D printed replica and manipulate it while preserving the original objects. A 3D scan of a human-sized statue with the Artec Eva handheld 3D scanner. 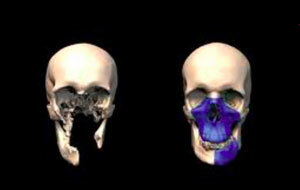 The 3D reproduction of a skull that allows students to examine it while preserving the original one. Researchers worldwide can share 3D models obtained by 3D scanning and collaborate remotely. Instead of having to ship archaeological remains or items, 3D scanners allow scientists to capture 3D models of these artifacts, The 3D files obtained can then easily be shared via internet with the global scientific community. The development of virtual museums is supported by the overall growth of the 3D printing ecosystem, including non-contact 3D scanners. For example, French startup Arskan 3D scanned some of the main pieces from the Museum of Fine Arts of Lyon, to create an experience out of the ordinary. The launch of this interactive experiment in fall 2015, accessible via an internet connection, will make the Lyon Museum the first virtual 3D museum. 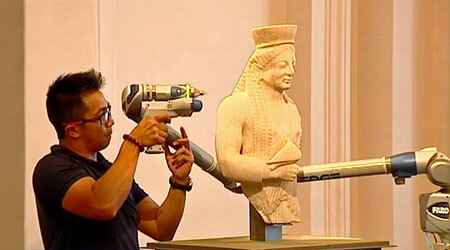 A member of Arskan scanning in 3D a statue with the 3D scanner FaroArm. 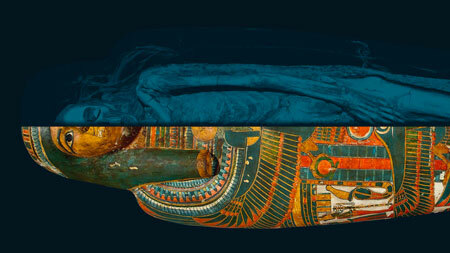 A dual view of a “fardo”, a Peruvian coffin and its virtual exploration conducted by the Quai Branly Museum. Thanks to 3D scanners, it is possible to create “virtual explorations” , based on a 3D rendering of a given archaeological sites, monument or piece of art. The Quai Branly museum in Paris uses 3D scanning to allow people to “see through” ancient coffins filled with artifacts, which could not be opened without damaging the items inside. With 3D scanning, archaeologists or museum curators can improve the conservation of their collections. They can even repair or duplicate the most damaged items, by using 3D printing and 3D scanning. It only takes a few minutes to 3D scan a human-size statue. The 3D model obtained (a simple file) can then be saved, archived, edited using a CAD software and 3D printed. Note: non-contact 3D scanners are often recommended to avoid damaging the most fragile items. A 3D scan of an ancient mummy. 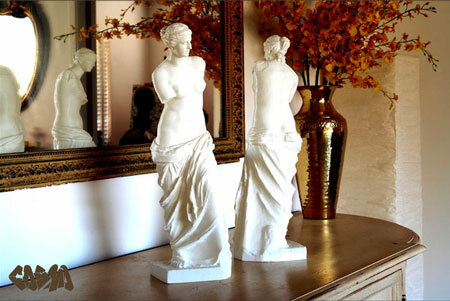 Two statuettes of the Vénus de Milo 3D printed thanks to 3D files available on the Thingiverse platform. Visitors who own a 3D printer can download 3D models from the museum’s exhibition and 3D print them at home. This license system is offered, for instance, to visitors at the Art Institute of Chicago. For this type of use, the extrusion technology is recommended, but it only allows to 3D print objects in plastic. 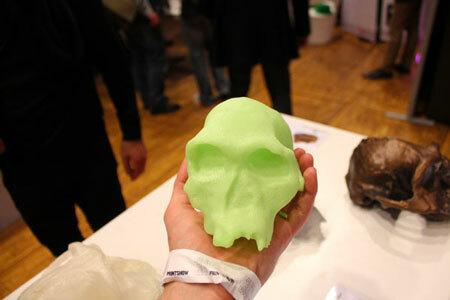 With 3D printing, museums can create realistic replicas of objects from their collections. Visitors can then manipulate these 3D printed versions without damaging the originals. 3D printing also offers the opportunity to create physical representations in 3D of paintings. The Prado Museum and the Museum of Manilla have already taken advantage of these opportunities. For instance, in Spring 2015, an exhibition at The Prado Museum allowed blind visitors to discover five masterpieces thanks to 3D printing. Those paintings in relief allowed visitors to experience the exhibit by touching the 3D printed version of the masterpieces. An innovative way of using 3D printing and to prove that art goes beyond senses. Sketchfab > Museums. More than 30 museums, including the famous British Museum and The Metropolitan Museum of Art, share here thousands of high-resolution 3D models obtained from 3D scans of their collections. These files are even visible in VR (Virtual Reality)! MyMiniFactory > Scan The World. Thousand of 3D files from artists and museums all across the globe are available here, obtained from real life objects scanned in 3D. The designs are 100% 3D printable. 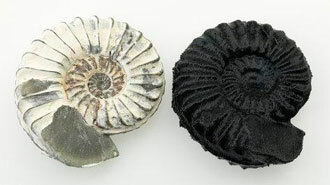 African Fossils. You will find here HD 3D designs of fossils, categorized by time era and type (hominids, animals, tools). A wiki section is linked to each 3D model, with detailed explanations and background information on the fossil. A powerful educative resource. MorphoSource. MorphoSource is an online repository which allows researchers from universities and labs worldwide to store, share, and distribute their 3D data. You will find here thousands of 3D morphological data sets, downloadable for free. 3D file formats include tiff, dicom, stanford ply, and stl. You can browse the cultural files by Institution, Taxonomy, Bibliography and Project. 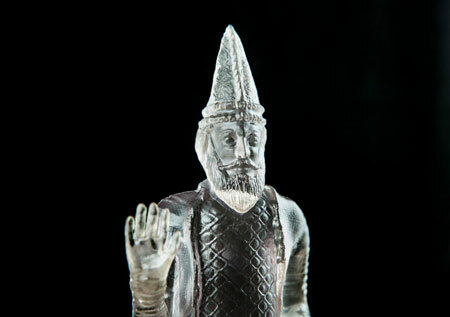 Using 3D printing, Iranian artist Morehshin Allahyari has set out to replicate the millennium-old sculptures from the Mosul Museum, which have been destroyed in 2015 by Daesh jihadists. With the help of experts from US and Iran universities, she managed to design 3D models of the destroyed sculptures. She based her work on documents left about these art pieces. 3D files of the sculptures will be made available to the public and then allow anyone to 3D print them at home. A great way to ensure that this heritage continues to live for the centuries to come. A 3D printed reproduction of King Uthal.